Grimsby Town are starting to get to grips with life back in the Football League once more after finally making a welcome return following six years in non-league. The Mariners enjoyed an excellent 2-0 win over early season high-fliers Morecambe on the opening day, before narrowly going out of the EFL Cup at Championship side Derby County. However, they then lost their next three league games, albeit it only by the odd goal each time against strong opposition in Wycombe, Colchester and Leyton Orient. A morale-boosting 5-2 home win over Stevenage stopped the rot in emphatic fashion, but Grimsby then shipped five the following game at Walsall in the EFL Trophy. 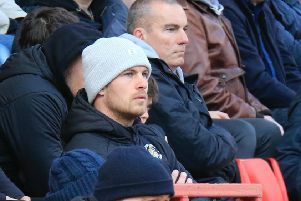 In the more important business of League Two though, Town earned an excellent point at Notts County last weekend, although the result was tinged with disappointment having led 2-0 at one stage. Boss Paul Hurst was busy on transfer deadline day too bringing in Barnsley striker Shaun Tuton, Manchester United keeper Dean Henderson and Queens Park Rangers midfielder Brandon Comley, all on loan deals. Like the Hatters, Grimsby are trying to move forward off the field too, having signed a deal with a leisure provider to build a new 14,000-capacity stadium. Developers Extreme said the £55m scheme for the Peak Parkway site would also provide an ice rink, other leisure facilities and housing. The site has been confirmed as North East Lincolnshire Council’s preferred location for the stadium, although a number of consultations will be held before any planning application is submitted. Team news: Luton have Alan Sheehan available once more after his calf injury suffered on the opening day has cleared up, while Glen Rea is back from international duty with the Ireland U21s too. Craig Mackail-Smith and Danny Green are continuing to step up their recoveries, but neither are ready just yet. For the Mariners, Kayden Jackson and Shaun Tuton (ankle) are in contention after suffering minor knocks, although the latter remains a slight doubt. Midfielders Sean McAllister and Rhys Browne have also returned to training but the game is expected to come too soon for the pair. Top scorers: Hatters - Danny Hylton (5). Mariners - Omar Bogle (5). Milestones: If selected, Pelly-Ruddock Mpanzu will notch up 75 games for the Hatters against Grimsby on Saturday. The 23-year-old is now one of Town’s longest-serving players, having first signed for the club back in December 2013. Man in the middle: Darren Deadman - experienced official who has taken four games so far this season, showing 10 yellows in that time. Refereed Luton once last term, the 1-0 home win over Morecambe, as he dished out 101 cautions and three reds during the campaign. Has officiated Hatters on four other occasions, most recently the 1-1 draw with Portsmouth in December 2014, plus a 1-0 Johnstone’s Paint Trophy win at Walsall in and 4-2 home defeat to Rotherham during the 2008-09 season. Also sent off Alan Goodall in a 3-1 defeat at Brighton back in 2007. Referees assistants are Joe Clark and Danny Gratton, with the fourth official Stuart Butler. In charge: Paul Hurst - 41-year-old, who had a lengthy playing career for Rotherham United, making over 400 appearances until he retired in 2008 to become joint manager of Ilkeston with former team-mate Rob Scott. The pair later took over Boston United in May 2009, before being appointed as joint bosses at Grimsby in March 2011. However, in September 2013, Scott was suspended and then sacked for gross misconduct, as Hurst, who holds a UEFA ‘A’ Coaching Licence, remained in sole charge and finally clinched promotion back to the Football League last season, beating Forest Green Rovers 3-1 in the play-off final at Wembley. View from the opposition: Mariners boss Paul Hurst speaking to the club’s official website: “We know for this game that we’re going in against one of the favourites, and a team, though it is early days like I mentioned but they are top of the league. “They’re leading goalscorers as well, I believe, so we know we’re in for a big test and one that we’re hoping to relish and look forward to. Friendly faces: Shaun Tuton - had a trial game for the Hatters in April 2015, while at Buxton, scoring during the 3-0 win over Gillingham, but wasn’t offered a deal by Luton. Went on to FC Halifax before he was snapped up Barnsley in February of this year, making seven substitute appearances last term. Agreed a loan deal with Grimsby on deadline day, making his debut in Saturday’s 2-2 draw at Notts County. Played for both: Kingsley Black. Popular winger came through the ranks at Kenilworth Road, playing 156 times for Luton, scoring 31 goals, as he was part of the side who on the League Cup back in 1988. Headed to Nottingham Forest in 1991 for a fee of £1.5million before loan spells at Sheffield United and Milwall, before joining Grimsby in 1996, making almost 150 appearances, scoring eight goals. One to watch: Omar Bogle - 23-year-old striker who was once linked with a move to Luton earlier in his career. After spending time with West Bromwich Albion, Birminghan and Celtic in his youth days, went to Hinckley United and then had a prolific spell at Solihull Moors which lead to his move to Grimsby in June 2015. Netted 16 goals in 48 games as the Mariners won promotion, including two in the 3-1 play-off final win over Forest Green and has started this season well too. Opened his account against Colchester, then bagged a hat-trick in the 5-2 thumping of Stevenage and made it five in eight matches with a goal against Notts County on Saturday. We’ve got form: Town haven’t found it easy going against Grimsby in meetings at Kenilworth Road, winning nine, drawing nine and losing six of the 24 matches, scoring 45 goals and conceding 34 in that time. Hatters have enjoyed two 6-0 wins though, back in December 1897 and then October 1981 thanks to four goals from Steve White. Although unbeaten in their last five home matches since 2003, the last three fixtures have ended in draws, with Town’s most recent win in Janauary 2011 as Claude Gnakpa’s strike settled a Conference encounter. Last time out: Luton were held to a goalless draw by Grimsby Town in their last meeting at Kenilworth Road, that a Conference clash in September 7, 2013. Hatters: Mark Tyler, Ronnie Henry, Scott Griffiths, Steve McNulty, Alex Lacey (Jim Stevenson 46), Jake Howells, Andy Parry, Jonathan Smith, Luke Guttridge (Alex Wall 84), Paul Benson, Alex Gray (Shaun Whalley 71). Subs not used: Elliot Justham, Mark Cullen.